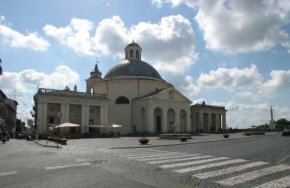 Visitors to Rome have so much to see in the Eternal City that they don’t necessarily think of going to Ariccia, a small town located less than an hour by train from the StazioneTermini (ill. 1). They would be making a mistake, especially for those enamored of Baroque art. 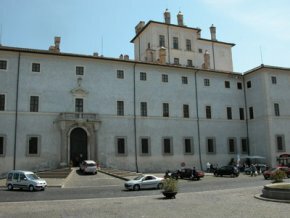 Indeed, Ariccia, where the Chigi Princes (their family included Pope Alexander VII) resided is laden with Bernini’s presence as he was in charge of many projects here, and directed notably the building of the church and a part of the Palazzo Chigi directly opposite it. Although the monuments are today polluted by car traffic (a 19th century bridge and the steep streets make it impossible to avoid this heavily frequented location), they retain their beautiful bearing. The church (ill. 2) cannot be counted of course among Bernini’s most striking accomplishments. With an oval shape, like Sant’Andrea al Quirinale, there is no question that its façade is not as fine. However, the way in which the two small palaces embrace it on each side is very original. A fresco by Guillaume Courtois (il Borgognone), an artist who frequently collaborated with Bernini (and also painted the Crucifixion of Saint Andrew over the altar in Sant’Andrea al Quirinale), decorates the choir. Across from the church, the Palace offers a majestic presence with its imposing façade (ill. 3). Since 1999, the ground floor and the first story contain apartments furnished by the Chigi, including many paintings, sculptures and art objects from the Seicento, among these two paintings by Michele della Pace, left on deposit by the great Milanese collector Luigi Koelliker. The chapel houses a large red-chalk drawing painted directly on the wall by Bernini. The most original aspect of the palace is the presence since 1999 of a new museum which today houses over 200 paintings from four donations. The first one was that of the historian Maurizio Fagiolo dell’Arco, who died prematurely in 2002. It includes 48 works from 17th century Rome, essentially studies and portraits, thus determining the museum’s orientation and its title of Museo del Barocco Romano. 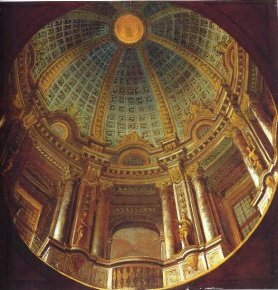 A specialist of Baciccio particularly, Fagiolo dell’Arco owned no less than six paintings by the artist including a study for a corner piece of the cupola of Sant’Agnese in Agone, in the Piazza Navona (ill. 4). 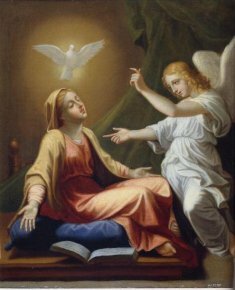 The collection also holds works by other followers of Bernini and Pietro da Cortona (Guillaume Courtois, Ludovico Gimignani, Ciro Ferri…), four by Andrea Pozzo including a rare study for a fake cupola-1 (ill. 5), a charming Sassoferrato, a Saint Cecilia inspired by an engraving after Raphael and which is a welcome change from his countless madonnas, one by Andrea Sacchi, another by Pier Francesco Mola… There are also several paintings done by French artists in Italy. Besides Guillaume Courtois (who however became totally Italian, at least in style), the collection offers a painting by Jean Lemaire (an artist for whom Maurizio Faggiolo dell’Arco wrote the monograph), a Jacques Stella, a very good old copy of the Annunciation by Poussin (ill. 6) probably due to a painter in his circle and a Lamentation over the Dead Christ by an anonymous artist. The Fabrizio Lemme donation which took place last year brought a further dimension to the museum. The interview with the collector here tells us how and why Ariccia benefited from such an act of generosity which extended the museum’s collection to 18th century Rome. As Fabrizio Lemme explains, some of the paintings had been exhibited in Paris or published, in an appendix to the catalogue for the Louvre exhibition. A work giving a thorough listing of the holdings donated to Ariccia, with excellent entries, appeared last year. 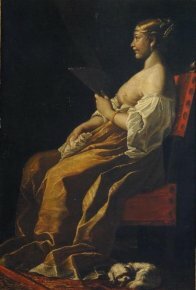 The reader can discover other works purchased by the collector since the original donation, a few rare changes in attribution (for example, a Virgin with the Instruments of the Passion, n°86 of the repertory at the end, is no longer ascribed to Ludovico Mazzanti but is listed rather as an anonymous Roman artist of the early 18th century ; ill. 7). 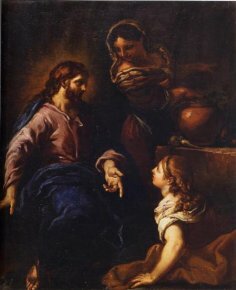 Three paintings fall outside of the Roman Baroque and belong to Mannerism : the Raffaelino Motta da Reggio (Saint Jerome in Penance) which opens the catalogue, and the two works by Cavalier d’Arpin which join the very beautiful The Arrest of Christ on copper already donated by Faggio dell’Arco. A complete list of all the paintings, even all the artists, would be long and fastidious. We will limit ourselves to those works which we consider most important. Thus, Campaspe by Mattia Preti (ill. 8), the group of studies by Giacinto Brandi (ill. 9), Lazzaro Baldi, Giuseppe Bartolomeo Chiari, Benedetto Luti, Placido Costanzi, Antonio Cavallucci… These names, and many others, reflect the activity of almost all the painters working in Rome in the second half of the 17th and in the 18th century. 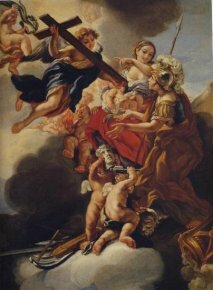 A beautiful study for a décor for Saint Peter’s in Rome by Baciccio completes the already extensive representation of this artist in the collection ; an impressive Veronica on the Path to Calvary (ill. 10) provides an example by Carlo Maratta ; Corrado Giaquinto, a native of Naples but also active in Rome, is presented here with two studies, one being particularly beautiful : Saint Francis de Paul Crossing the Strait of Messina ; Pompeo Batoni is seen in a Saint Bartholomew and Giuseppe Cadès in two studies. Donations seem to encourage more of the same. Early this spring, the museum enriched its holdings once more with two other donations, the one by Renato Laschena, former council president, offered by his widow on Fabrizio Lemme’s suggestion and one by Oresto Ferrari, an art historian and author notably of an impressive monograph devoted to Luca Giordano. Both collections were published in a special catalogue put together for the occasion and for the reopening of the museum, with its definitive hang, which was held last November 9th. 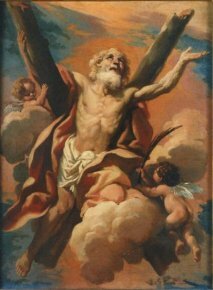 The Laschana collection includes 14 paintings which are essentially from the 17th century. 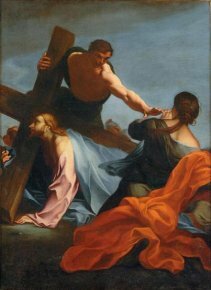 There are notably an important scene illustrating the plague by Mattia Preti, another Baciccio representing Saint Andrew and his Cross, two large canvases by Giacinto Brandi and one by Daniel Seiter (ill. 11), the first painting by this Austrian artist who was active in Rome for a long period to enter the museum. The Ferrari collection (ten paintings and two drawings) is dominated by a masterpiece due to Michele Rocca, The Massacre of the Holy Innocents (ill. 12) and two landscapes by Cornelis van Poelenburgh and Salvator Rossa. A drawing by Luca Giordano, two anonymous Venetian paintings and two Neapolitan studies (Pietro Bardellino and Domenico Antonio Vaccaro) extend, along with Salvator Rossa, the geographical scope of the museum while remaining within the Baroque. Let us point out two other donations of lesser importance : a Filippo Lauri and a Francesco Trevisani presented by the gallery owner Ferdinando Perretti also with an ensemble of 60 sketches by Giacomo Zoboli (1681-1767) ; a drawing by Marco Benefial was donated last month by Vittorio Casale. We would like to underscore the remarkable hang. The rooms are not very big thus adapting themselves perfectly to the size of the paintings, essentially studies. This allows the works to be presented close together, in a style which evokes Italian palaces (like the Galleria Spada, or the Palazzo Pitti in Florence) and to be displayed with others from the same donation, while still remaining on a very human scale, in no way overpowering the visitor or preventing an individual focus on any one picture. Each collection is exhibited in its own room, thus maintaining the unity and personality of the collector behind them. There is one regret only, however : although the Palazzo Chigi contains some Baroque busts in the apartments, the Museo del Barocco for the moment does not hold any sculptures. We hope that this aspect will be developed in the future, as it is difficult to imagine the Baroque without statuary art. Collective work, Il Museo del Barocco Romano. Le Collezioni Ferrari, Laschena ed altre donazioni a Palazzo Chigi in Ariccia, De Luca Editori d’Arte, 2008, 168 p., 25 €. ISBN : 978-88-8016-904-8. Collective work, Il Museo del Barocco Romano. La Collezioni Lemme a Palazzo Chigi in Ariccia, De Luca Editori d’Arte, 2007, 288 p., 60 €. ISBN : 978-88-8016-825-6. Both works may be purchased on the editor’s website. Collective work, Pittura barocca romana, dal Cavalier d’Arpino a Fratel Pozzo. La collezione Fagiolo, Skira, 1999, 174 p., 30,99 €. ISBN : 88-8118-624-1.